This summer weather is making us hungry for ICE CREAM! 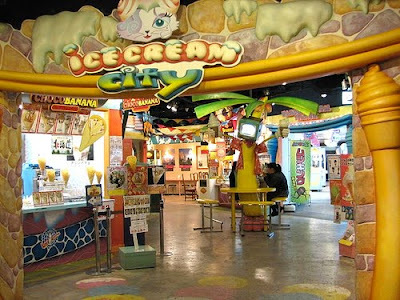 Luckily there is Ice Cream City in Sunshine City complex in Tokyo where there are numerous kiosks and booths featuring every flavor of ice cream imagineable! Start out at the "Cup Ice Museum" where there are wall-to-wall freezer cases filled with individual cups of ice cream from all over Japan with flavors such as cheese, bell peppers, chicken, chestnuts, melons, cow tongue, curry, shark fin, squid and octopus. Then move onto the soft ice cream section called, "Soft Cream", where you can get 4 flavors in one dish!